Church of St Michael is a 12th century stone Norman church, which was defensible. Standing within the Roman fort of Abbalava on Hadrian's Wall, its stone was used in the building of the church. In the mid 14th century a defensible three storey square west tower, with massive angle buttresses was added. The ground floor with its tunnel vaulted roof is only lit by a narrow western slit and a later gun-loop in the north wall. A draw-bar through an iron yet with bolts above and below, secured the entrance from nave and a newel staircase gives access to the upper levels. Altered in 1713 and restored in 1881, the church is unique in having adjoining defensible towers on the east and west ends. In 1307, King Edward I died encamped on Burgh marshes and for 10 days he lay in state in the nave, until his son Edward II and the Court came to pay their respects. 4 miles west is Drumburgh Castle. 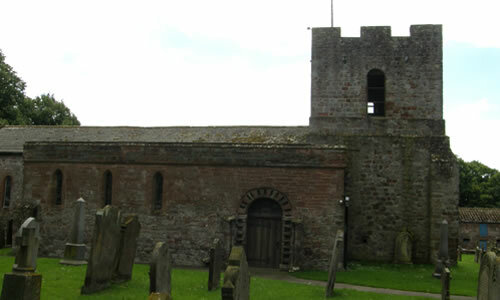 Church of St Michael is located in Burgh by Sands, 5 miles north-west of Carlisle, on the B5307-local roads.